There are several reasons of why it might be useful to convert your blog articles to PDF. It’s an easy way to make the most out of your content and increase traffic to your blog and other websites. The best of all: you can do so by using content you already created. The blog articles you wrote already are your subjects of work, which means that you do not have to shed more blood, sweat and tears to create new content. Simply take your best articles or newest blog posts and convert them to PDF. We are no SEO blog and we do not want to elaborate all the reasons why you should or are advised to convert your blog posts to PDF. We are here to provide a fast solution! 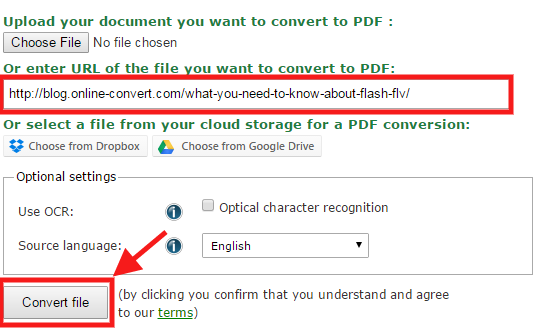 To generate a PDF out of your blog article, you do not need any plugin fr Firefox or Chrome Add-On. You also don’t have to download any program and install it on your computer. Everything can be easily done online without any installation or unnecessary download. 2. Enter the URL to your blog article in the URL field. 3. Click on “Convert file”. 4. After the conversion is done, the PDF is ready. Depending on your browser, it is downloaded automatically or you have to save it from your download manager. 5. Open your PDF to see your blog post. And that’s it! Five simple steps and you have a PDF of your blog articles, containing images, links, graphics, tables, … What more could you need? Now, your converted blog post is ready for usage. You can provide it for your users as a download or add it to your newsletter as a small goodie for your subscribers. Of course, you can submit your PDF to other sites and directories and thus drive more traffic to your page. It’s your article, your PDF, feel free to utilize it the best ways possible! One popular way its to upload your PDF and thus your blog content to slideshare. This service is closely related to LinkedIn and allows you to upload and display your PDFs as neat slide shows. You can share them on social media and easily embed them on your webpage. There’s even a special WordPress shortcode to display your slideshow on your WordPress blog.